We are in the back side of a storm system, there is a chance for a few places to a trace and big swells coming out of the west. The best chance for a touch of light sprinkles will be west of the mountains. 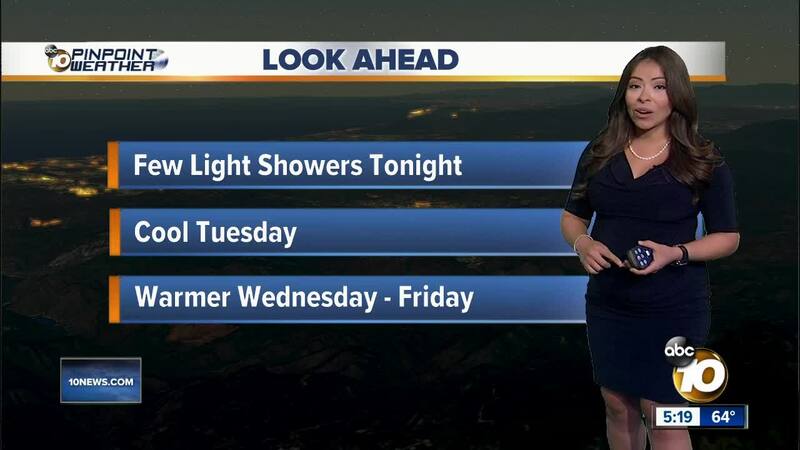 Becoming drier on Tuesday with the winds turning out of the east and warming San Diego county through Friday. Surfers are loving the westerly swell, although it is making conditions dangerous for boaters. High Surf Advisory will be in effect until 10pm Tuesday night for beaches up and down our coast. The prolonged swell is out of the WNW averaging 10-13 feet. Dangerous rip currents and dangerous swimming conditions will also persist through the duration of the high surf advisory. High pressure builds back up on Wednesday with bright sunshine and a warming trend for the third week of December. Perfect weather set up for last minute Holiday plans or shopping.